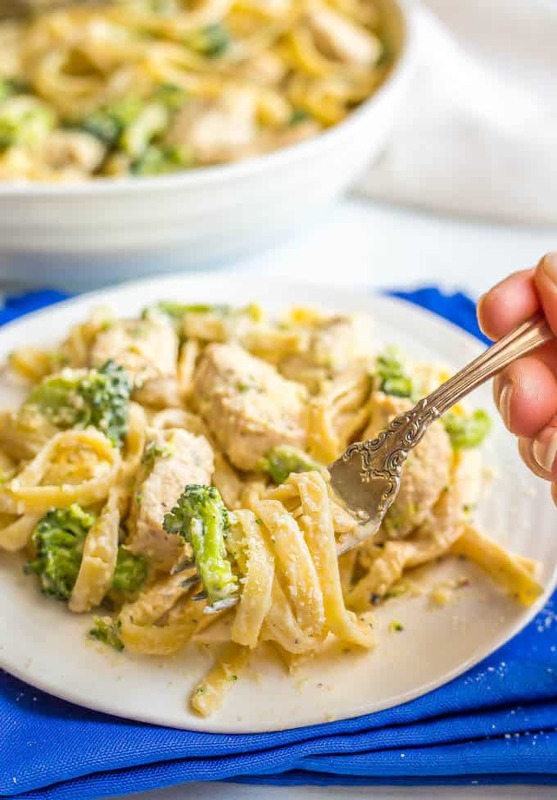 Healthy chicken Alfredo with broccoli is a quick and easy dinner with a lightened up but delicious creamy sauce coating every bite. Sure to be a new family favorite! Did you all have a fun Valentine’s Day? The kiddos had parties at school and brought home ALL the candy, which of course just made their day! We played Valentine’s bingo, decorated hearts and made some peanut butter chocolate chip snack bars. Because, chocolate. And last night, my husband and I had a rare weeknight out. We went to see a live performance of a music trio with an amazing guitarist. Charlie Hunter plays this custom-made guitar that has extra strings and allows him to do bass and guitar. It’s pretty cool and we had a great time! 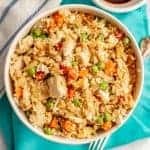 Today I’m back to it and I’m bringing you another quick and easy chicken dinner. Yes, I’m so predictable and I’m so OK with that. 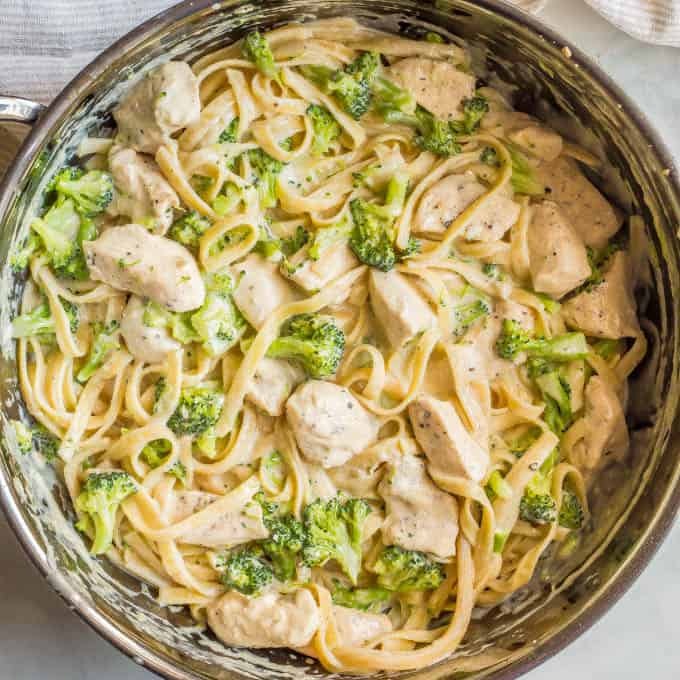 My healthy chicken Alfredo with broccoli is ready in about 20 minutes and you’ll go crazy for the luxurious sauce. I use and recommend whole what fettuccine if you can find it, but you can substitute regular or even use spaghetti. Just pay attention to the cooking time on the box and adjust accordingly. 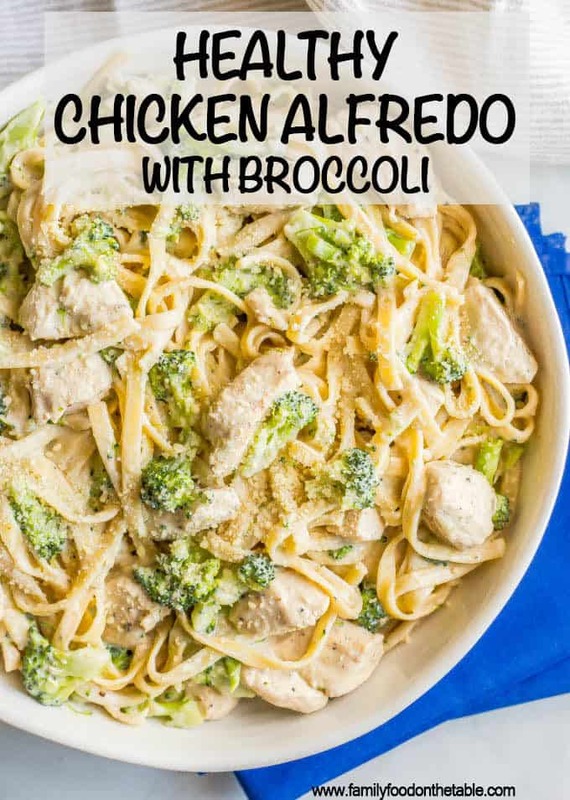 To make this recipe so quickly, I cook the pasta and broccoli in one pot and have the chicken going in a skillet at the same time. 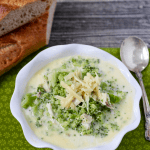 You need to cut the broccoli into small florets so that it will cook along with the pasta. I use skim milk and reduced fat cream cheese, but you can substitute your milk of choice and full fat or fat free cream cheese, if you prefer. 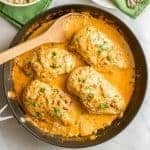 If you are ready for comfort food but still want to stick to your healthy eating goals, this is the dinner for you! P.S. 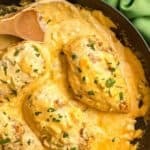 Looking for other quick and easy chicken dinners? And check out my VIDEO for this recipe! Healthy chicken Alfredo with broccoli is a quick + easy dinner with a lightened up but delicious creamy sauce! Bring a large pot of water to a boil. Add a good dose of salt and then then fettuccine. 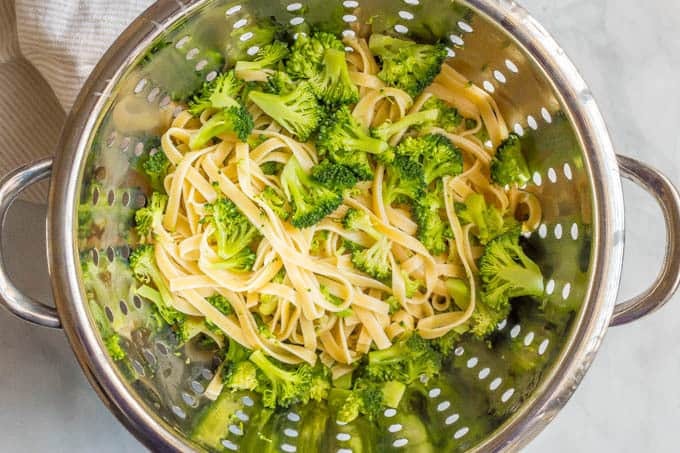 When two minutes remain in the pasta cooking time, add the broccoli to the pot with the pasta. Then drain the pasta and broccoli. Meanwhile, heat 1 teaspoon of the olive oil in a large sauté pan over medium heat. Season chicken with half of the salt and pepper and add to skillet. Saute chicken for 6-7 minutes, until well browned. Add garlic and cook another 1-2 minutes, until chicken is cooked through. Remove chicken pieces to a plate and cover with foil to keep warm. Add remaining 2 teaspoons olive oil to the pan. Add flour and cook for 1 minute - it will be clumpy. Just push it around the pan to cook some of the raw flour taste out. Slowly add the chicken broth and then the milk, whisking constantly to get all the clumps out and make a smooth sauce. 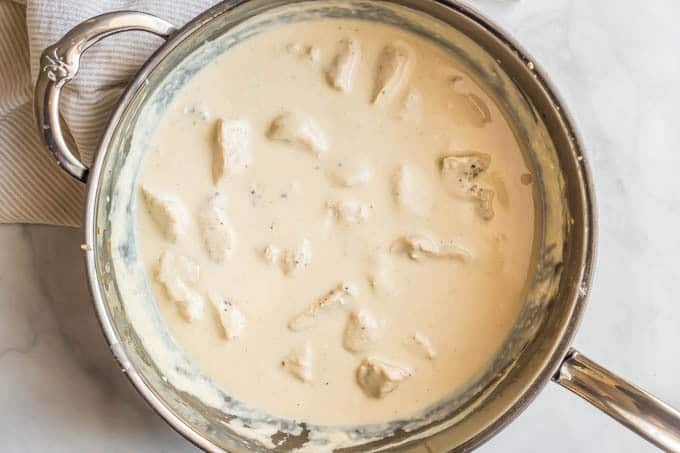 Bring the sauce to a simmer than add then cream cheese, Parmesan and remaining salt and pepper. Season to taste with salt and pepper, add extra Parmesan if desired and enjoy! 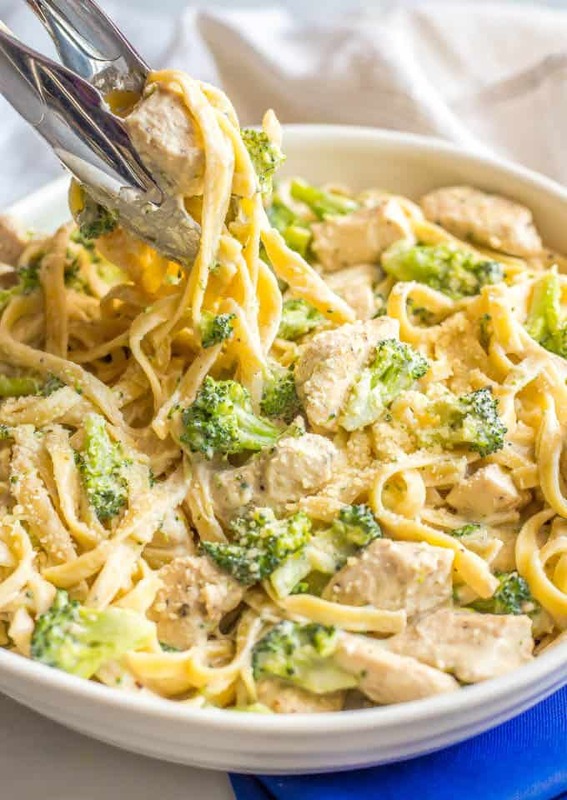 I use and recommend whole what fettuccine if you can find it, but you can substitute regular fettuccine or even use spaghetti. Just pay attention to the cooking time on the box and adjust accordingly. Yum!!! 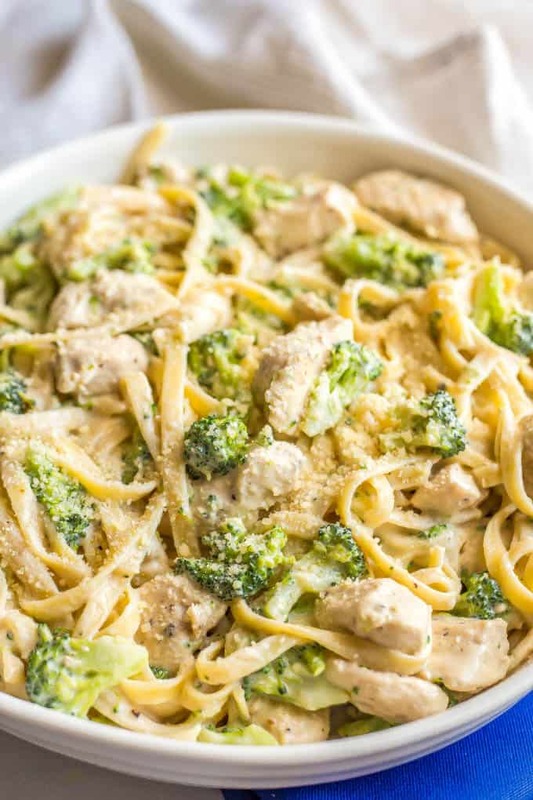 I am definitely making this for dinner tonight! I hope you enjoy it Carolyn! How much is the serving size in the recipe? I(t seems an awful lot of calories for one serving or are you cunting for all 4 servings? Hi Laura! This makes 4 large servings. Each is just under 700 calories for the whole dinner, which is pretty good! For me, i would have to cut the serving size in half since I aim for only around 1600 calories a day. Because you have to have garlic bread with this meal. Sounds like a plan – trade in the garlic bread and have a smaller portion! Hope you enjoy it! 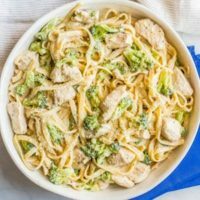 Would you recommend subbing out the pasta for spaghetti squash? Or if I want to reduce carbs and up veggies in this should I just do less pasta and more broccoli? Thanks, love your recipes! Hi Alycia! 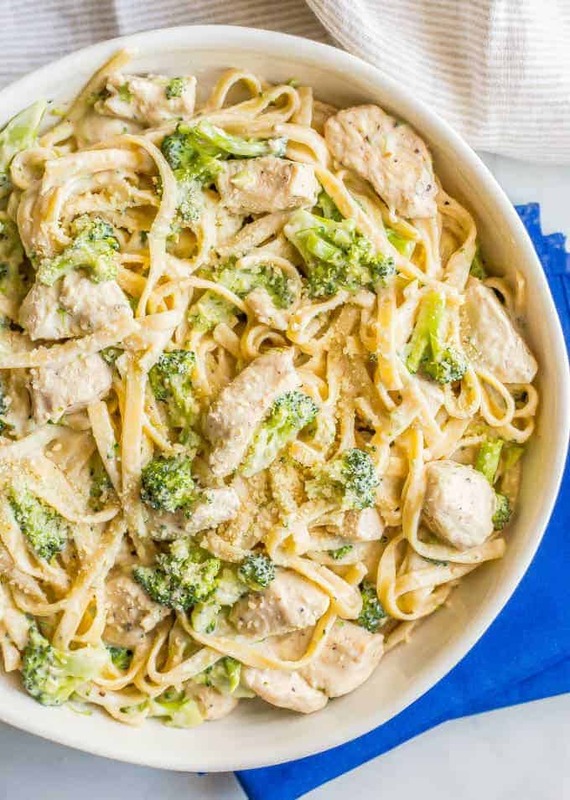 Yes, you could absolutely use spaghetti squash or some zucchini or veggie noodles instead of the pasta for a low-carb option here. 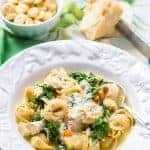 If you want to add more veggies, you could also stir in some green peas or wilt some spinach into the dish at the end. Would love to hear what you try! Yes and I thought it worked just fine! I know some people are against freezing pasta, for texture reasons, but it doesn’t bother me one bit. This is crazy. I just want the recipe, not the pictures, not the reviews, not the video, not the ads and not the music. Just the recipe please. This is a personal blog, so yup, there are stories. I also like to give special notes, tips and substitutions to help people with the recipe. 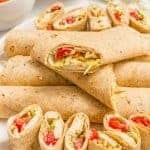 It sounds like you may want to find free recipes at places like FoodNetwork.com or else pay money and get recipes from magazines or cookbooks.